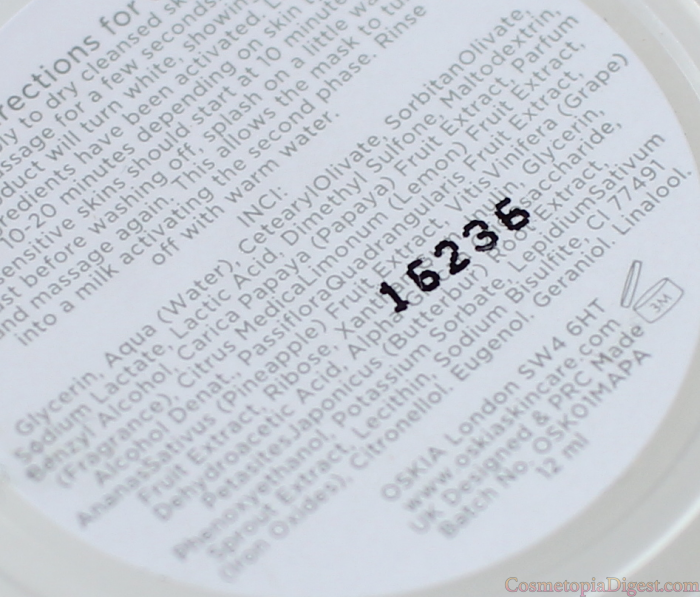 Oskia is a luxury British skincare brand whose signature ingredient is MSM or methylsulfonylmethane. MSM, a.k.a. the Beauty Mineral, is a natural form of sulphur that helps circulation, decreases inflammation, and promotes collagen and keratin production - thereby keeping the skin (and hair) in good nick. 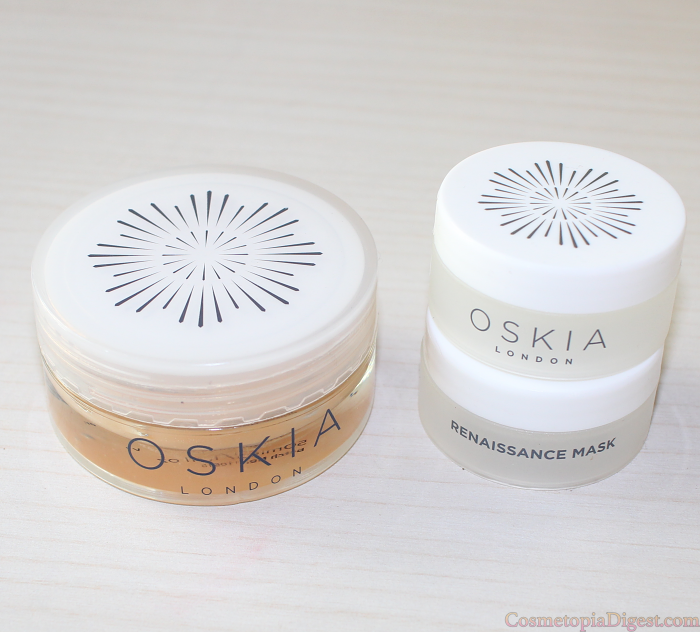 I have been using the Oskia Renaissance Cleansing Gel and the Renaissance Mask on a regular basis since last year. The Renaissance Mask is a rinse-off enzyme-based facial treatment with MSM, lactic acid, probiotics, and a host of fruit extracts. Scroll down for more on the Oskia Renaissance Mask. The full-sized Renaissance Mask comes in a thick glass tub - bring your own spatula. There's 50ml in the full-sized tub, and a generous 12ml in the sample tub. The peachy-pink hued product smells... pleasant and not sulphurous; Oskia says the aromatic scent is a combination of rose, passion fruit, and chamomile. I apply a thin layer once a week all over my cleansed face - it goes on translucent, but I massage it for a while and then it turns white, as Oskia claimed. I leave the mask on for 20-30 minutes. I then splash some water and get the mask to emulsify, before rinsing it off and starting my routine. There is no tingling, redness, or discomfort during the exfoliation, and my face is not tight or uncomfortably dry afterwards. Also, my skincare (essence > serums > mist > emulsion > facial oil > sleeping pack) goes on and absorbs faster on the days I use this mask. On days that I use this mask, I skip other acids, because the mask contains AHAs. My skin gets an instant glow with this mask - kind of as though I've just had a pampering facial. I love using it on nights before a special occasion - which is rather how I used Glam Glow Youth Mud before. For me, this mask is gentler and far more effective an exfoliant and a de-clogger than Glam Glow, which also used to dry my face out. There are different levels of chemical exfoliants, and enzyme-based products - such as the Oskia Renaissance Mask - are among the gentlest. Nonetheless, this one does its job as effectively as Alpha-H Liquid Gold. Because I am currently undergoing acne scar revision procedures (subcision and Infini RF done so far), I don't have a non-nausea-inducing after- picture to show you. I'll update it once my sessions are all done. 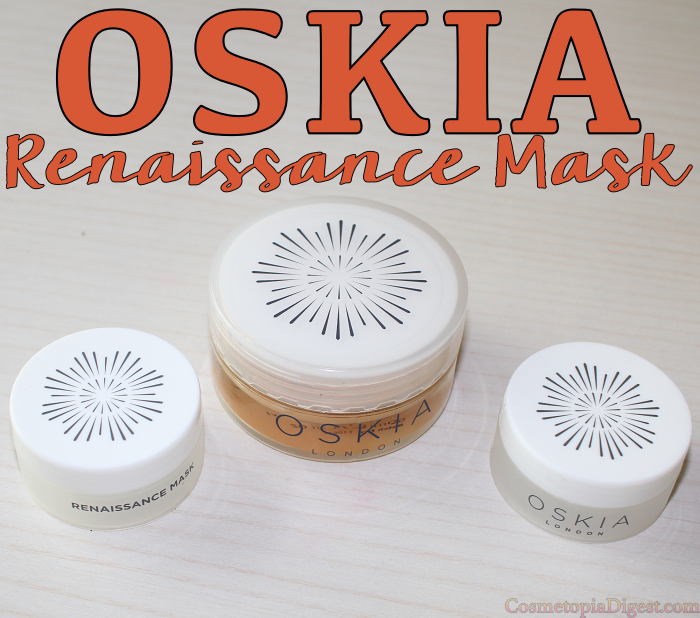 Oskia Renaissance Mask is an indispensable part of my "face mask wardrobe" - I use clay masks, peeling/exfoliating masks, treatment or nourishing masks, hydrating masks, and sleeping packs. This one belongs to the third category. If you want instantly glowing, fresh skin, this is a must-have. I've taken to using it before putting on makeup on special occasions - my face always looks better afterwards, and there's no caking at all.